National Australia Bank ((NAB)) is a financial services organization providing products, advice and services through its major Australian franchise and businesses in the United Kingdom, New Zealand, the United States and Asia. In New Zealand, it operates through Bank of New Zealand. In April 2014, JB HI FI Ltd announced that National Australia Bank Limited and its linked entities ceased being a shareholder of the Company. Today the company announced results which saw a 14.2% drop in cash earnings to AU $5.7 billion. This was due to associated costs of repaying customers affected by bank misconduct as well as restructuring costs. Profit for the year up to the end of September was still up 5% to AU $5.55 billion. The company's chief executive stated that it was a challenging year. The dividend yield is currently 8.0 %. Broker/Analyst consensus is "Hold".
? The pay-out ratio suggest could be cut to the dividend.
? Management changes could prove to be a positive catalyst further down the track.
? A weaker capital position relative to its peers.
? A delay to the de-merger of the wealth business looking likely.
? Leveraged to any deterioration in the business credit book.
? Plenty of exposure to the deteriorating housing market.
? Recent results in line with expectations.
? Not re-pricing mortgages-which leaves the bank at a disadvantage for revenue. There was a nice looking Head & Shoulders reversal pattern in place during our last review although the neckline still needed to be cleared. This did prove to be the way forward although there's been no follow-through to the upside, with weakness returning quickly, invalidating the pattern. With the daily chart now lacking symmetry we'll flip back to the weekly which has been our preference in the big four banks over recent months and even years. The large descending triangle has invalidated due to the low of wave-A being overcome. This now opens the door for a zigzag to unfold although normally price will head down to the wave equality projection within such a pattern. If this is to be the way forward, an area around $20.00 could be achieved as a worst-case scenario. However, as can be seen on this chart the 61.8% retracement level of the whole leg higher to wave-(A) has already been tagged and rejected. That said, price would need to impulse higher from here on in for this to be significant. Not impossible, although thus far the bounce has been lacklustre and looks corrective in nature which isn't a good start. One thing we can say is that the further price heads down through the 61.8% level, the greater the chance that something more bearish is going to unfold. In other words, even a rotation down toward the wave equality projection would be less than ideal from a Fibonacci perspective. The bottom line is, the banks are struggling for traction, with several reasons applicable to NAB mentioned above. There is uncertainty regarding earnings, and a threat regarding a cut to the dividend moving forward. 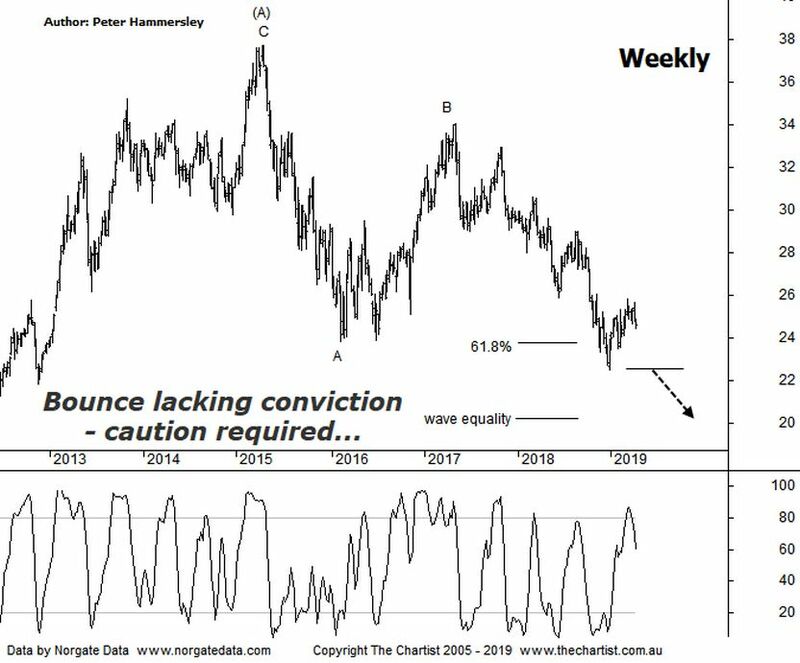 A few weeks ago the banks were making the right noises regarding a bounce although once again there's been no follow-through, with lacklustre price action being the way forward. It's been the turn of the miners to push the XJO higher which has been the trait for a significant period of time now. No doubt the banking sector will have its day in the sun again although for now it's best avoided. We'll keep an eye on the larger degree patterns as there is upside potential, but we may need to see further weakness before the bigger buying opportunity presents itself.